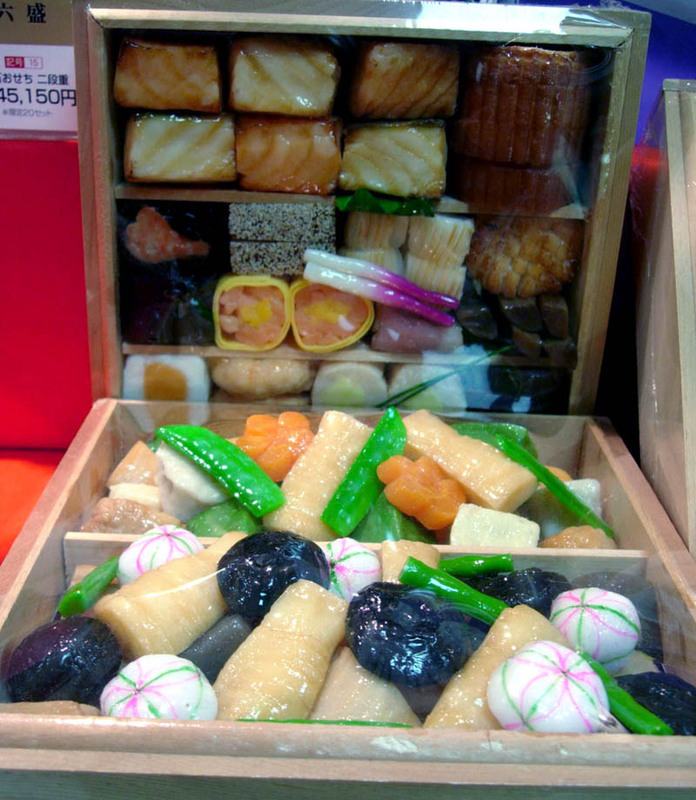 "Osechi ryori" is what most people in Japan eat at the beginning of the new year. Regardless of how many times you splurge at Nobu, osechi isn't something you'll ever find on a Japanese menu. Its time and place are the first few days in January, in the Japanese home. Osechi ryori was originally a way for housewives (and their families) to survive the first several days of the New Year, when stores throughout Japan were closed. The foods that make up osechi can be prepared in advance and then sit out in a cool area for a few days without spoiling. Most often everything is placed in compartmentalized lacquer boxes that are stacked in layers. 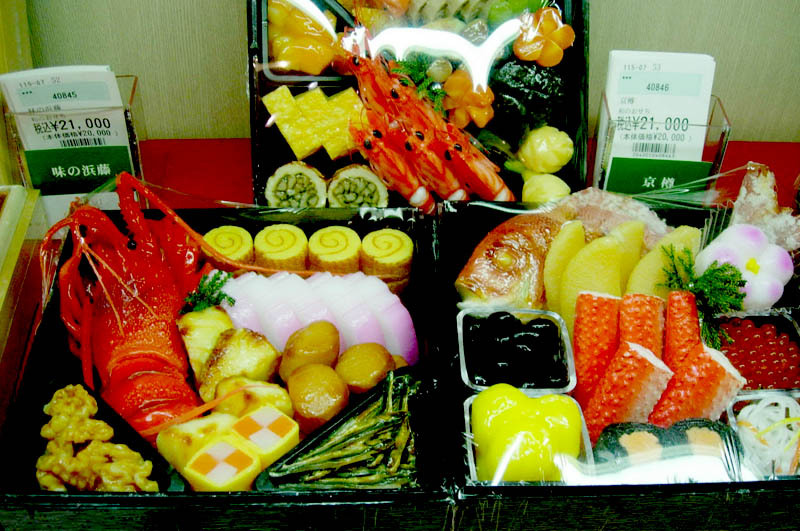 Today most osechi is purchased - either at department stores or at local supermarkets. Prices start at under Y10,000 (for portions that will feed a few people for at least three days), but it's also possible to spend literally a hundred times that amount (the equivalent of US $10,000). 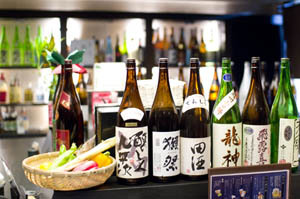 The high-end osechi food is made by famous chefs (or more likely, famous restaurants), and - typical of Japanese custom - is limited in production. High-priced department stores like Takashimaya start taking orders for osechi in late October, and often the most popular varieties sell out within a few days. 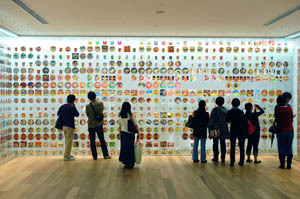 Many of the food items represent prosperity, good fortune and health. (Unfortunately, regardless of how much osechi I've eaten I haven't seemed to have gotten any smarter, richer, or more industrious.) The basic components are the same, but regional differences are reflected in the sweetness or saltiness of the flavoring and the use of local ingredients. One thing to keep in mind when looking at osechi is that presentation is very important. You may notice a pleasing balance of colors. What may be harder to notice, though, is the efficiency with which each layer is packed. The more elaborate osechi will have vegetables arranged in ornate designs, representing seasonal shapes such as pine cones and plum flowers. 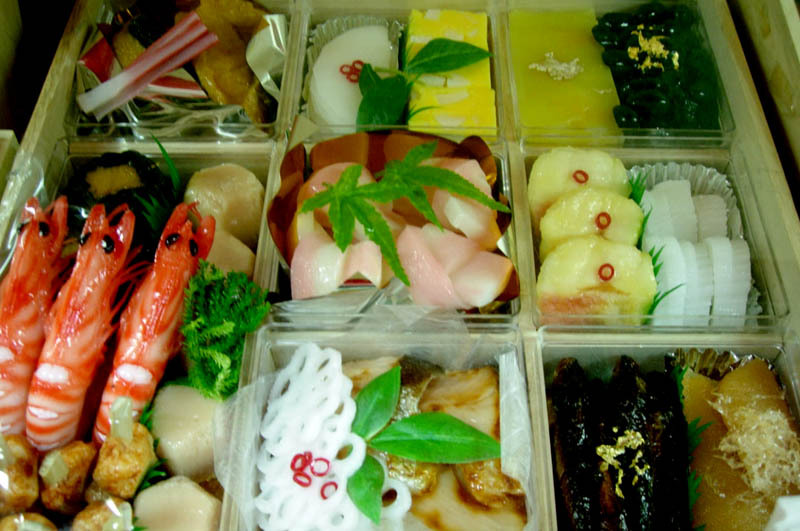 The section below describes some typical osechi food items, and explains what they represent. Kazunoko (herring roe) - tiny yellow fish eggs. Like the tobiko you often find at sushi restaurants, kazunoko have a bite or crunch to them, however, the eggs are not loose. 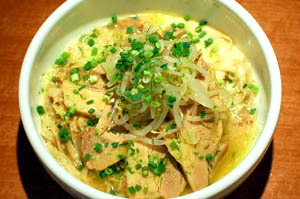 They are marinated in a broth of dashi, sake and soy sauce. Kombumaki are nothing more than the umami-rich kombu rolled tightly and bound shut with a ribbon of gourd strip (kampyo). 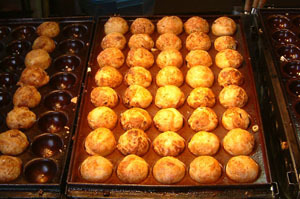 Often kombumaki are stuffed with salmon. This is also cooked slowly in dashi, mirin, sugar, and soy sauce. Datemaki looks like the tamago-yaki (egg custard) you often find in a bento box, but here it's made with a fish paste and has a sponge-like texture. It's quite sweet. Kamaboko, a dense cake of fish paste, is red and white (traditional New Year's colors). You can often find thin slices of this on your soba. Another red-and-white food you'll find is called namasu - typically daikon and carrots pickled in vinegar. 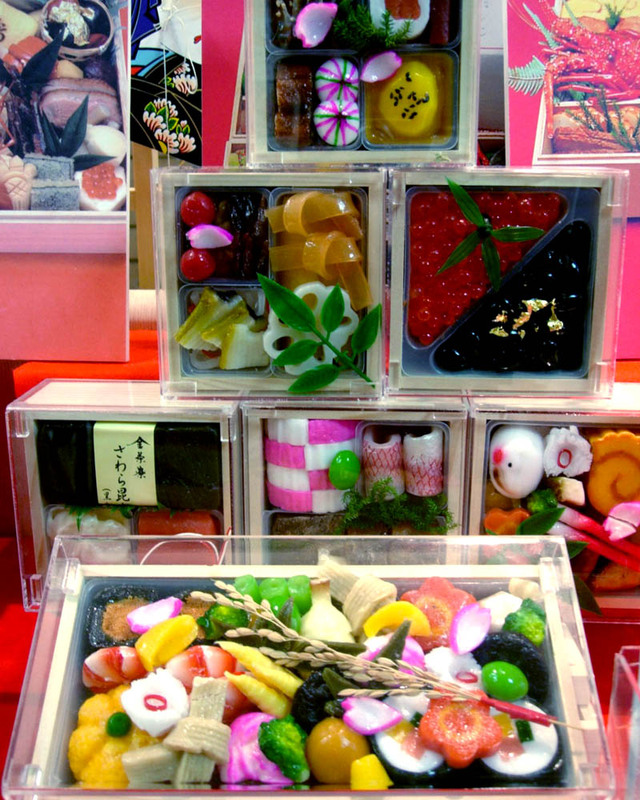 Konnyaku (devil's-tongue starch) and fu (wheat gluten) will also be sprinkled throughout the stacked boxes. Text and photos: Yukari Pratt.